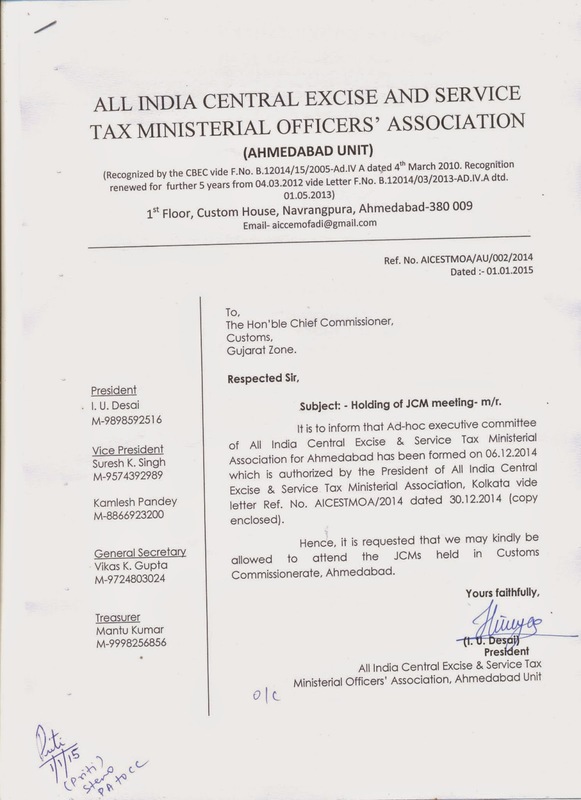 CUSTOMS CENTRAL EXCISE AND SERVICE TAX MINISTERIAL OFFICERS' ASSOCIATION, AHMEDABAD: Submissions to the Chief Commissioner, Central Excise & Service Tax, Ahmedabad Zone and the Chief Commissioner, Customs Gujarat Zone. Submissions to the Chief Commissioner, Central Excise & Service Tax, Ahmedabad Zone and the Chief Commissioner, Customs Gujarat Zone. Ahmedabad, the 02nd January, 2015. 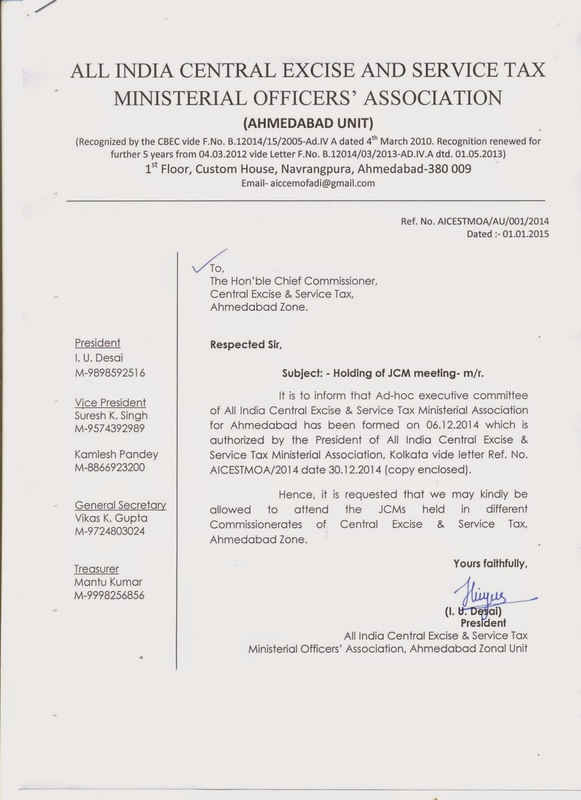 The Ahmedabad Unit of All India Central Excise and Service Tax Ministerial Officers' Association has submitted letters to the Chief Commissioner, Central Excise Ahmedabad Zone and the Chief Commissioner, Customs Gujarat Zone. Copy of the letters are placed in this post. Vide the said letters the President, AICESTMOA, Ahmedabad Unit, has requested the Chief Commissioners that we may be called for the JCMs. Henceforth, if we are called to attend the JCMs, the office bearers of the Unit will attend the JCMs without fail & will raise the various issues of the members related to their career advancement & other miscellaneous issues. It is sincerely hoped that all the members of this Association from the rank of Lower Division Clerk, Tax Assistant, Senior Tax Assistant and more particularly the Officers in the rank of DOS and AO remain united and support the Association wholeheartedly.